The Book of Romans is a corrective to a lot of wrong beliefs among Christians today. Warren Wiersbe begins his commentary on Romans in the following words: “If you are tired of all the wrong things in your life, in the lives of others, then Paul’s Epistle to the Romans is the book for you.” In the passage we are about to read Paul wants the readers to understand that salvation is not just about forgiveness for sins, it is also about deliverance from sin. It is not enough to have forgiveness for what we have done, we also need deliverance from who we are. Romans 6:1-4 1What shall we say then? Shall we continue in sin that grace may abound? 2Certainly not! How shall we who died to sin live any longer in it? 3Or do you not know that as many of us as were baptized into Christ Jesus were baptized into His death? 4Therefore we were buried with Him through baptism into death, that just as Christ was raised from the dead by the glory of the Father, even so we also should walk in newness of life. 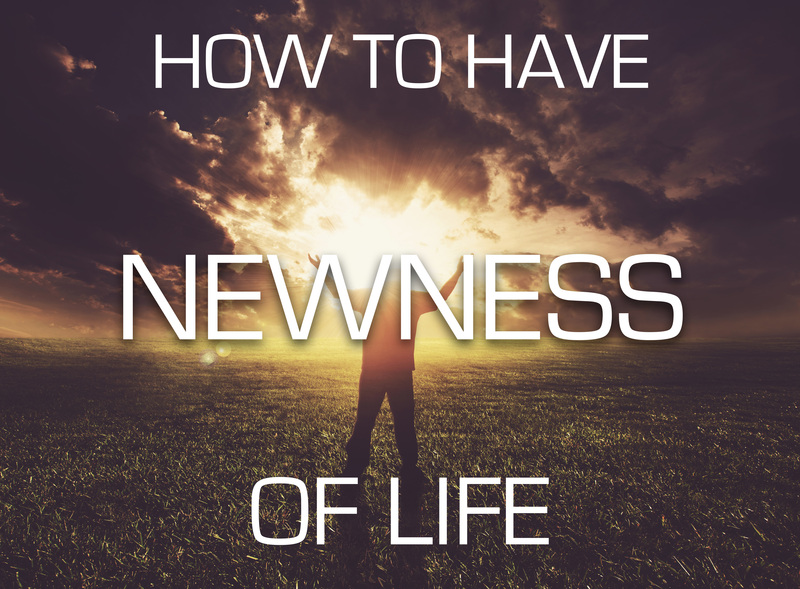 In the passage we just read Paul is going to teach us 4 important steps TO HAVE NEWNESS OF LIFE. Application: Do you find yourself living in defeat? Do you find yourself frustrated with your constant battles against old habits and hang-ups? Do you wish you had the newness of life that is promised in the Bible? If yes, then this message is for you. 1. ALLOW GOD TO TEACH YOU ABOUT GRACE. Background: In chapter 5 of Romans, Paul explained to us that all of us come into this world under the “share everything Adams family plan.” Under this family plan, our father Adam signed us up for the physical and spiritual death; judgment and condemnation; and sinners by nature. We were locked into this plan, never to get out. That’s why lost people do the things they do. Sometimes, even saved people live under the old family plan. They try to stop doing bad things and they do them even more.6:1 1What shall we say then? Shall we continue in sin that grace may abound? Jesus came into this world to bring us a second share everything family plan. Under this family plan, our Savior Jesus Christ has signed us up for abundance of grace and the gift of righteousness; justification of life (when God sees me, He sees Christ); and righteous by nature. Previously we were under the condemned plan but now we are under the grace plan. Grace = getting what we don’t deserve. More we sin, more grace we get. For e.g. How would you like that kind of phone plan? More you talk/text, more minutes you get! Application: Fight the urge this morning to live by rules. 2. MEET THE NEW YOU. What is Paul’s answer? 2Certainly not! How shall we who died to sin live any longer in it? Sorry, you are already dead to sin. For e.g. The safest place in the world is in a cemetery. No one can hurt you. You may hurt yourself but no one else will! Verse 3Or do you not know Paul is asking us “do you not know” the facts of your salvation? What are the facts? 3Or do you not know that as many of us as were baptized into Christ Jesus were baptized into His death? What is Paul talking about? Now here is the heart of our salvation. We’re all born in the family of Adam– the family of sin. We have two problems—sins (things we have done wrong and do wrong) and sin (our sinful nature). Jesus took care of Problem #1 by becoming our Substitute – taking my sins upon Him on the cross. He gave me His righteousness. What about Problem #2—my sin nature? The Blood cleanses us from the debt of sins but we still carry the family germ of sin that was in Adam and was passed down to us. What we need is to get out of the family of sin. The Blood cannot get us out of the family. The only way to get out of the family is by death. Jesus not only died as our Substitute, but He also died as our Representative – representing our death in the family of Adam. This was no half hearted/pretend/playact death. Listen to verse 4 4Therefore we were buried with Him through baptism into death, In other words, God included my death in the death of Christ. In the foreknowledge of God we were crucified and buried with Christ. Application: Most of us try to deal with sin by trying to suppress it and fight it. I am not going to get angry; I am not going to be envious; I am not going to lust. Before you know it, you are back in it. God deals with our sin nature by removing the sinner. It’s not enough to just die from the old family. You also have to be born again into the new family. Verse 4 again: that just as Christ was raised from the dead by the glory of the Father, even so we also should walk in newness of life. Meaning: Not only did we die in Christ but, on the third day, we were also raised with Him. We died in Him as the last Adam and we live in Him as the second man. Now let’s live as if you are in newness of life. It’s not hard to take to heart that we died with Him. It is hard to understand that we are alive with Him. Listen to verse 5 “For if we have been united together in the likeness of His death, certainly we also shall be in the likeness of His resurrection,” Your death is past tense and your resurrection is also accomplished. What is interesting is the imagery that Paul uses to describe this death to sin and resurrection to newness. It is baptism. The baptismal pool is really a coffin. Some people look at baptism as a non-essential. They say, “You do not have to be baptized to be saved.” That’s true but Baptism is an outward expression of an inward change. It symbolizes our death, burial and resurrection with Jesus Christ. It tells the world that we have been united with Him in death, burial, and resurrection. It is a sign that I am now cut off to the old world and have entered into the new. By the way since the earliest church history, the church always baptized the way we do it – Ephesus, Emmaus, Milan, Tunisia and on and on. 3. YOU ARE NO LONGER A SLAVE TO SIN. God deals with our sin nature by making us weaker and weaker; by removing the sinner; by putting us to death. But He doesn’t leave us dead. He gives us new life. Listen to verse 8—Now if we died with Christ, we believe that we shall also live with Him, 9knowing that Christ, having been raised from the dead, dies no more. Death no longer has dominion over Him. 10For the death that He died, He died to sin once for all; but the life that He lives, He lives to God. So what should you do with all this knowledge – Verse 11 Likewise you also, reckon yourselves to be dead indeed to sin, but alive to God in Christ Jesus our Lord. God is not asking you to go crucify yourself or to go do penance for your sin. He simply wants you to reckon it. Background: The word “reckon” can be a little confusing. For e.g. “Are you coming to the birthday party?” “I reckon.” It means “I guess” or “I think” or “maybe.” That is not the meaning here. The Greek word means “count” or “calculate.” It is a mathematical term. It is an accounting term. You cannot judge if the artist or singer or writer has been perfectly accurate but you can tell if an accountant has been accurate. Let me warn you – the moment you start reckoning, be ready for a fight. The Devil will fight you tooth and nail. He will lie to you. He will point out all your faults. You will have to reckon every moment who you are in Christ. As long as we keep our eyes on Christ, we are able to walk this life. Every time, like Peter, we take our eyes off Christ, we begin to sink. When we abide in Him and obey Him, that’s when we walk in victory. 4. SAY HELLO TO YOUR NEW MASTER. 12Therefore do not let sin reign in your mortal body, that you should obey it in its lusts. Background: What the Bible is saying is, “Now that you know that you have died in Christ and are alive in Him; now that you have reckoned this to be a fact; what’s next? Your mortal body belongs to God. Your eyes/ears/mouth/hands/feet/every inch of you is His. 13And do not present your members as instruments of unrighteousness to sin, but present yourselves to God as being alive from the dead, and your members as instruments of righteousness to God. Often people say, “If you want to be saved, you have to become a slave of Jesus Christ.” It sounds good. It’s just not biblical. God does not want my old self that was a slave of sin. He wants that which has passed through death to resurrection. He wants me to present to Him that which already belongs to Him. For e.g. When we were travelling overseas, I gave a certain amount of money to the oldest two of our children. Just in case I happen to lose my wallet, we will still have some money. When we finally arrived on the other side, I asked them to hand it back. Whose money was it? Mine or theirs? Mine. When I hear someone who claims to be a Christian say, “My money, My time, My house, My job.” You have a problem. Either you are still lost or you don’t get it. Everything is now His. I am no longer to sin because these eyes, mouth, hands, feet, everything belongs to Him. We are His slaves. Application: You say you are a Christian. Are you a slave of Jesus Christ to holiness?